Invisible Monsters is a novel by Chuck Palahniuk, published in 1999. It is his third novel to be published, though it was his second written novel (after Insomnia: If You Lived Here, You'd Be Home Already). The novel was originally supposed to be Palahniuk's first novel to be published, but it was rejected by the publisher for being too disturbing. After the success of his novel Fight Club, Invisible Monsters was given a second chance, and a revised version of it was published. The first edition was released in paperback in 1999, and on June 11, 2012, it was published in hardcover, in a revised edition titled Invisible Monsters Remix (ISBN 978-0393083521). The novel has been adapted into a graphic novel by comic artist KGZ, a.k.a. Gabor Kiss. The narrator of the story is an unnamed disfigured woman who goes by multiple identities, notably Daisy St. Patience and Bubba Joan—identities that were given to her by Brandy Alexander, with whom she spends the majority of the book. The novel opens on the wedding day of Evie Cottrell, whose house is burning to the ground. Brandy, has been shot by Evie, and asks the narrator to tell her life story. She remembers how she first met Brandy, and the story is told in a non-linear sequence of memories. The narrator is the daughter of a farmer. Her older brother, Shane, was kicked out of the house for being gay after a test for strep throat revealed itself to be gonorrhea. After their parents receive a stranger's phone call that Shane is dead from AIDS, they become obsessive supporters of gay rights, so that even in death, Shane gets more parental attention than the narrator. This attention is a huge source of resentment and hate for the narrator towards her brother. The narrator sought a career in modeling in attempt to get attention for herself. Her best friend in modeling school is Evelyn "Evie" Cottrell. Evie begins a secret relationship with the narrator's policeman boyfriend, Manus Kelley. While driving down the highway, the narrator is shot in the face and her jaw is ripped off. She immediately drives to the hospital where she recovers, her lower jaw lost and modeling career destroyed. In speech therapy she meets Brandy Alexander, a trans woman. During their sessions, Brandy attempts to teach the narrator how to give herself a new life and a new identity, giving her a new name, Daisy St. Patience, the first among many new identities given to the narrator. Evie begs the narrator to come live with her. As soon as the narrator arrives Evie goes to Cancún, leaving the narrator alone in the house. The first night, someone breaks in. It's her boyfriend, Manus Kelley, holding a huge kitchen knife. Because of the rapid non-linear motion of the novel's events, the narrator has often referred to Manus as Seth, an identity given to him by Brandy, and it is not until this moment in the novel that the reader learns that Manus and Seth are the same person. Manus and Evie's affair is exposed and both claim that the other was the one who shot the narrator. The narrator locks Manus in a closet and sets fire to the house. The narrator forces Manus to ingest pills and medication before locking him in the trunk of his own car. She flees to Brandy's apartment. While at Brandy Alexander's apartment (which is a hotel room), she meets the Rhea sisters, Brandy's roommates. The three are drag queens and performers who are paying for all of Brandy's operations. The narrator learns that Brandy Alexander is really her brother, Shane, and that he strives to look like his sister (the narrator) through surgery. Brandy wants to find her sister, and is unaware of the narrator's true identity. Brandy then leaves with the narrator, now called Daisy, and Manus, now called Seth. They travel the country, and while pretending to be viewing rich homes for sale, steal whatever drugs or medication they can find and alternately ingest and sell them. Later, the narrator hears of Brandy's stories of sexual abuse from a policeman, who is revealed to have been Manus. "Brandy" divulges that she is not actually transgender—Shane chose to become a woman when he does not want to be because he sees it as a way to disfigure himself beyond being in the control of others. One day they are viewing a home and it turns out the realtor is the mother of Evie Cottrell. Her mother reveals that they are marrying Evie off to save themselves trouble, and also discloses that Evie used to be a man, and transitioned at a young age. The trio attend the wedding. Again the narrator sets fire to the home, and thus we are returned to the opening scene of the novel. It is revealed that Brandy originally met Evie in a transgender support group. Evie told Brandy of the narrator's gun accident, and Brandy reveals she has known that the narrator, Shannon McFarland, was her sister since the beginning of their friendship. In turn, the narrator reveals that she shot herself in the face to permanently escape from being beautiful, mirroring her brother's decision to transition. Later, sitting in Brandy's hospital room, Shannon determines that she has never truly loved anyone. She looks down at Brandy and realizes that she loves her brother. Leaving her pocket book with all of her identification, she tells a sleeping Brandy that since Shane is still confused about what he wants out of life, he can have the only thing she has left, her identity. The novel ends with Shannon leaving the hospital and into the world to find a new start. In the Remix version, it is revealed that Shannon, now going by Daisy St. Patience full-time, has created a cemetery after her parents have died, in which you can bury relatives you disliked with spiteful sayings carved into the tombstones. Additionally, Daisy creates a group for disfigured girls called "Elephant Women". In the end, we see her at her wedding, getting married to an unidentified man. Narrator, A former fashion model, now disfigured by a mysterious gunshot injury. She goes by many different names throughout the book, most notably Daisy St. Patience and Bubba-Joan. Brandy Alexander, Queen Supreme, aka Princess Princess—A transgender woman whom the narrator meets in the hospital shortly after her own mysterious gunshot injury. Brandy encourages Narrator to hide her disfigurement and attempt to live a new lifestyle. Manus Kelley—Narrator's ex-fiancé, an ex-police officer. He goes by many different names throughout the book. Evelyn "Evie" Cottrell—Narrator's former best friend, also a fashion model. The Rhea Sisters—Three male drag queens who Brandy describes as being family. They dote on her and pay for all of her surgeries. 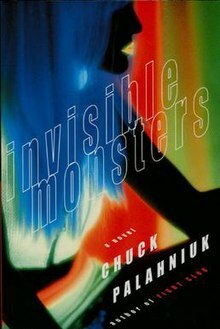 Originally released in paperback in 1999, the first hardcover edition of Invisible Monsters was published on June 11, 2012. This edition is a restructured version of the novel, entitled Invisible Monsters Remix. It contains a new author's introduction, explaining that the linear structure of the first edition was not the novel's original intent. Instead, this new edition of the novel presents the chapters in mixed order with instructions on which chapter to read next, and new chapters have also been added. MacLaren Productions Inc. acquired rights to the novel in 2009 and planned to begin production of a film adaptation in Vancouver in spring 2011 but this never materialised. The company established a website to help raise support where people can demand the book be made into a movie by submitting their email, name and location online. A Facebook group has also been set up under the search name "Invisible Monsters Film" to raise awareness for the film and generate support. Jeffree Star's song title "Your Heart Is My Piñata" is a direct reference to the Katty Kathy quote of the Rhea sister's invention, with Jeffree's debut album "Beauty Killer" containing several references to the novel. Panic! at the Disco's song "Time to Dance" heavily references the novel. Motion City Soundtrack has a bonus track on their album Commit This To Memory titled "Invisible Monsters", in direct reference to the novel. ^ Kiss, Gabor. "Invisible Monsters Comic Book". Retrieved 20 November 2011. ^ "INVISIBLE MONSTERS REMIX by Chuck Palahniuk - Kirkus Reviews". ^ "MacLaren Productions signs option for "Invisible Monsters"". MacLaren Productions Inc. 2009. Retrieved 2011-01-06. This page was last edited on 18 February 2019, at 00:36 (UTC).